Way back around last May, while Mama & I (but mostly Mom) were busy planning my wedding, she entered me into EVERY contest available. 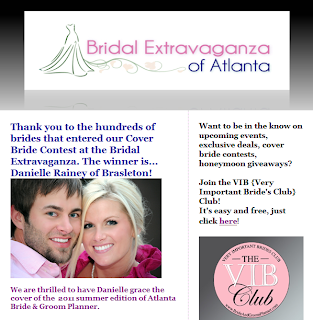 One of them was a cover shoot for Atlanta Bride & Groom Planner (which includes a massage and facial, sweet!). 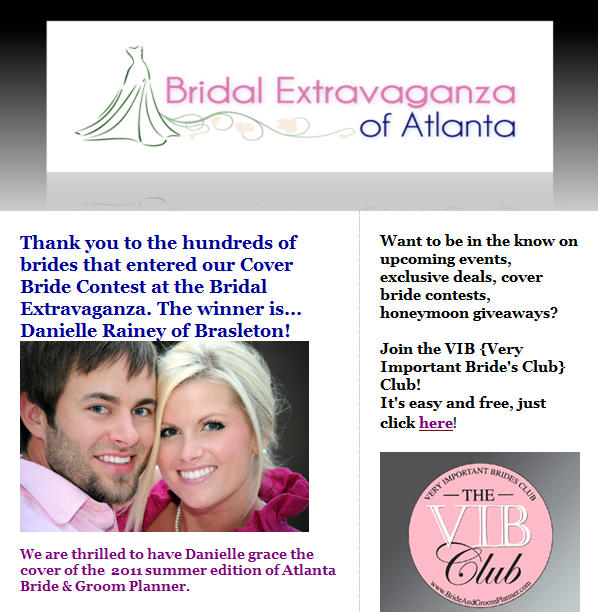 There were four finalists, and the guests at a bridal show at the Ritz in Atlanta voted on the bride that would make the cover. They brought us up on stage (totally felt like a pageant!) and I acutally WON! Can you believe that???? I had a make-up artist/hairstylist transform me into the look they were going for- a romantic, soft, sweet look. I LOVED my hair! I like to wear a LOT of eye makeup though, so I wish they would have let me wear more eyeliner and mascara and have a little softer lip, but it's okay. They didn't want me to look too harsh. Linda, the super sweet publisher of Atanta Bride & Groom Planner, let me listen to Pandora- the Queen station- on her phone while we were getting ready. They had four BEAUTIFUL dresses for me to try on, but here is the one we chose. Of course, this is before it was clamped (it was a little big), before we added the sash, jewelry and final hair, etc. We can't give away the cover!! I will say that I was absolutely EXHAUSTED afterwards!!! I know that seems weird because you're just being pampered and smiling for the camera, right? Wrong. I have a new respect for models. They totally have to capture feelings and stories with their facial expressions, eyes, etc. It is definitely more challenging than I thought. The photographer was SO wonderful. Can I please recommend Nadia D if you ever need a photographer? She was beyond FABULOUS!!!!! (I TOTALLY wish I could have had her for my wedding...but she was already booked!) I cannot even give her the accolades she deserves on here....she is just brilliant. My favorite thing about her is that she made me feel SO comfortable and confident even though I felt totally akward and weird. She directed me, gave me affirmation throughout the shoot, and paid attention to every little detail. She's just BRILLIANT!!! I loved her. So, I'm excited to see the shots come back in a few weeks. They'll select a photo at the end of March, send the book off to be published, and I think the next issue will come out in June. I'll keep ya posted! SO awesome!!! Such a great experience and it'll be so neat to see yourself on the cover :) I'm sure you'll look beautiful!!!! i totally want a signed copy - you're such a celeb now! Hi Danielle! I was looking up something on google when I ran across your blog post. Love it ;) You did a great job on the shoot. I am patiently waiting (ok, not really patiently) for the photos to choose from. Our most fabulous photog, Nadia D, has been super busy. We are thrilled to have you grace our next cover. You were a joy to work with. I'll be in touch soon! I hope to work with you again sometimes! You looks gorgeous. Love it.